Indianapolis, IN (August 2012) It’s been a busy year for GreenLight. We’ve increased production and revised a couple of our lines and packaging! As time progresses, you’ll see these changes hit the shelves. And, with all of these updates, we’ll be hitting our social media more often as well as providing more details and information to you, our collectors, than ever before. With all of these changes come new licenses as well, which brings us to Hollywood Series 4! 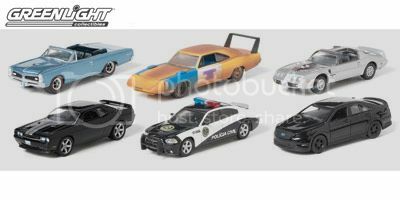 Hitting shelves throughout the coming weeks, we’re bringing new titles to this incredibly popular 1:64 line including Joe Dirt, Men In Black 3, I Dream of Jeanie and NCIS: Los Angeles on top of the already successful Fast & Furious franchise which features a new casting. Check out the image below for details or click here for a look at individual images on our Facebook. These 1:64 die-cast replicas feature detailed engines, real rubber tires, metal body and chassis, detailed graphics and production serialized numbering and are officially licensed by their respective auto manufacturers and entertainment titles. This release will be available through official GreenLight official hobby shops and wholesale dealers, as well as select mass retailers, including Toys 'R' Us and Meijer.